Conceptis Link-a-Pix are exciting, language-independent logic puzzles that form whimsical pixel-art pictures when solved. Challenging and deductive, yet easy to learn and artistic, Conceptis Link-a-Pix offer the ultimate mix of logic, art, and fun, while providing solvers with many hours of mentally stimulating entertainment. It will probably be no surprise to learn that the concept of Link-a-Pix puzzles, just like Pic-a-Pix, was also originally conceived in Japan. According to the Editors of its puzzle magazine department, Byakuya Shobo were the first publishers to introduce these puzzles into the Japanese market. The original brand name for Link-a-Pix puzzles, as given by Byakuya Shobo, was Number Net, reflecting the number networking required to solve them, and all puzzles were hand made by Japanese puzzle constructors. In March 2002, after a year of intensive development, Conceptis Link-a-Pix algorithm was completed and the first puzzles released. Thus, Conceptis became the first company in the world able to mass produce Link-a-Pix puzzles with the aid of computers. In May 2002, Gakken, one of Japan's largest magazine and book publishers, started publishing Conceptis' Link-a-Pix puzzles in My Crosswords magazine under the brand name Pict-Link. Soon after, Pict-Link puzzles in color were also published in Gakken's Logic Paradise, one of the most popular picture-logic magazines in Japan. In June 2002 Sanoma Uitgevers (Netherlands) launched Zoekplaatjes, the world’s first magazine dedicated to Link-a-Pix puzzles. 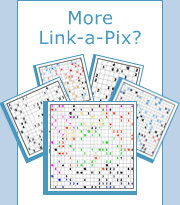 In July 2002 and in cooperation with Sharp Space Town, Gakken began offering Conceptis' Link-a-Pix puzzles, also branded as Pict-Link, to J-phone mobile phone users in Japan. Encouraged by the Pict-Link success on J-phone, Gakken and Sharp Space Town launched another service later that year for the popular NTT DoCoMo iMode mobile phones. In December 2002, Sun Magazine started to include several Link-a-Pix puzzles in each issue of the monthly Oekaki Mate magazine. Other Japanese publishers including Hagishima-Shupan Cosmic International also publish Conceptis Link-a-Pix puzzles. In March 2003, Gakken and Sharp Space Town expand Pict-Link puzzle services to KDDI au mobile phone subscribers in Japan. With this, users of the three most popular mobile phone systems in Japan enjoy Link-a-Pix at any place and at any time. In May 2003, Enigma, a bi-monthly Link-a-Pix magazine by Puzzler Media Ltd. becomes available in WHSmith shops in the UK and to subscribers worldwide. In October 2003, Logimage magazine by Keesing France begins offering Logipix issues dedicated to Link-a-Pix puzzles. Today, puzzle magazines with Link-a-Pix by Conceptis are published regularly in over 35 countries including USA, Japan, the UK, Germany, Holland, Canada, France, Russia, Poland, Finland, Denmark, Israel, Hungary, Austria, Spain, Norway, Sweden, Greece, Switzerland, Belgium, Italy, Australia, New Zealand, Czech Republic, Brazil, Turkey, Korea, Thailand, Romania, Philippines, Estonia, Latvia, Peru and more.